“Thank you for taking the time to visit our fundraising page on iDonate.ie The Sunriseupcroaghpatrick event take place on Saturday June 29th 2019 at Croagh Patrick in Westport and this page allows you to donate equally to all 3 chosen charities: Young Parkinson’s of Ireland Association as part of the Parkinson’s Disease Association of Ireland, Huntington’s Disease Association of Ireland & the Irish Motor Neurone Disease Association. All funds raised here will go directly to these great causes. I hope you can help me by donating whatever you can. Simply click the Donate button above. All donations are processed securely. You can also share this page using Share options below. This is a great way to show your support. Many Thanks for your support. “Sunriseupcroaghpatrick” is a not for profit Partnership. It is not a registered Charity but will organise events to raise funds for the chosen Registered Charities in a fully transparent and compliant manner. 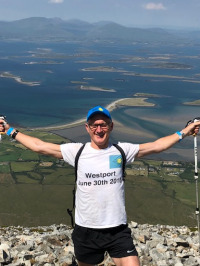 Neil, Thank you so much for your very kind donation to our fundraising drive for more specialist care via Young Parkinson’s Ireland, Huntington’s Disease Association of Ireland and the Irish Motor Neurone Disease Association. You support is very much appreciated.